Rabbi Yuval Cherlow, a prominent Religious Zionist rabbi, says that his attendance at anti-Netanyahu rally was a one time event. 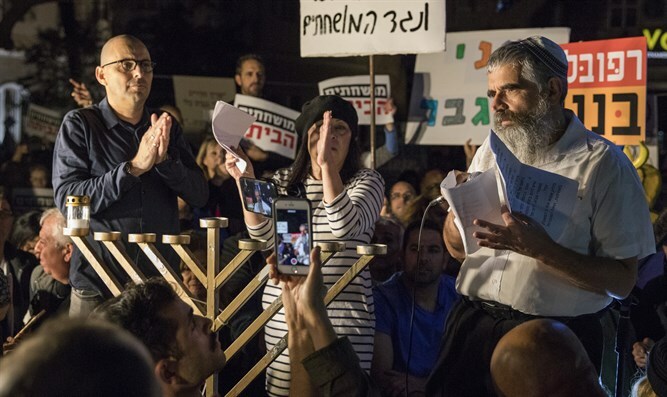 Rabbi Yuval Cherlow, dean of the Orot Shaul Yeshiva in Ra'anana, appeared to walk back his support of a weekly anti-corruption rally held every Saturday night in Tel Aviv, two weeks after he drew criticism by speaking at the rally, a move critics claimed would only serve to harm the Israeli right. "My place is not at these demonstrations," tweeted Cherlow. "I went once, I did what I had to do, and that was it." Cherlow noted that while he did not regret his appearance two weeks ago, "I made it clear that this was a one-time event." "You need to find the people of truth wherever they are, even if it means going to the other political camp," said Cherlow. "I went once and that was it. There is no reason to keep attending". Cherlow's decision to attend the left wing rally, where BDS supporters often hold signs in support of boycotting Israel, was controversial. Cherlow was harshly criticized on social media, where it was alleged that he was damaging the Religious Zionist community. "This is a political rally, and you're harming the entire right-wing," fumed one writer on Cherlow's Facebook page. Another wrote that "Rabbi Cherlow would never demonstrate for the residents of South Tel Aviv - these demonstrations aren't broadcast on every television channel. He would prefer to join the spoiled children on Rothschild Street." Rabbi Cherlow explained after the rally that he had attended because he felt that it was important that the fight against corruption be part of the right's discourse. "We need to show that we understand that the cause of fighting corruption is a categorical imperative as believers in the sanctity of the Land and that only through moral behavior will we inherit the entire land," Cherlow told Arutz Sheva.